I started calling them “sad days”—the days where I find it’s more challenging to manage my poor mental health, and redirect myself into focusing on something else. She’s right, of course—about the animals. That tight grip of sadness loosens as I am on the receiving end of seemingly endless kisses from Piper, an energetic, affectionate, and smiley Pit Bull. It’s a little easier to let go of that depressive feeling when a handsome, curious, and chatty goat named Martin is playfully bopping his head against the back of my leg. Little Acorn Sanctuary is located in Castle Rock Township outside of Northfield, Minn. 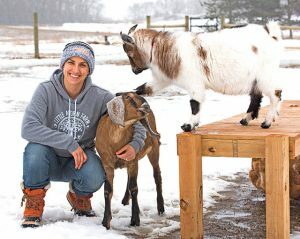 The couple who founded and operate the sanctuary, Tara and Becky Lien, along with their two young children, bought the property two years ago; Little Acorn itself is less than a year old, established as a non-profit during the summer of 2018. Originally from New Jersey, Tara Lien has lived in Minnesota for a decade. She concedes the winters have taken some getting used to. It’s the middle of January and cold on the day I visit her at Little Acorn. Both Tara and her wife Becky have day jobs—Becky is microbiologist; Tara is a school social worker. 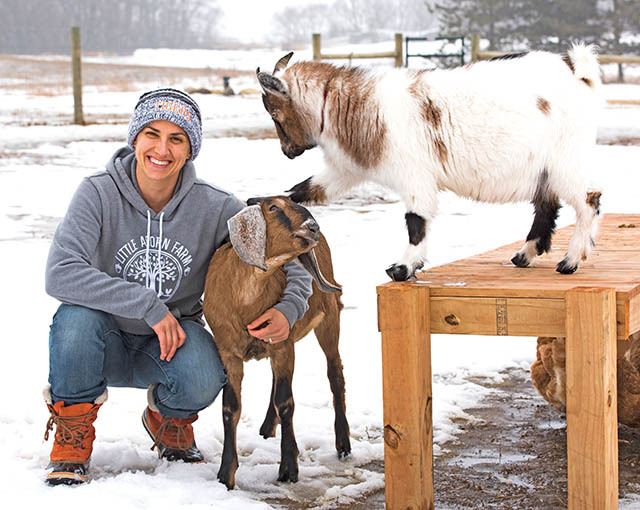 The family moved to Castle Rock Township because they were looking for a place where they could have backyard chickens as pets, more land to garden, and eventually, a couple of goats. The first two goats, Tucker and Riley, were not so much rescued as they were purchased, as babies, for $20 each, from very bad situation. “We drove halfway home and I’m holding these goats,” Lien recalls. “And they are covered in lice and fleas.” The animals were in such rough shape, they had to be shaved completely and given numerous shots and medications from a veterinarian. The Liens did not set out to become an animal rescue, or sanctuary—but that changed with the arrival of Martin. But the Liens had to figure out how to get Martin from Kansas to Minnesota. Through social media, seven different strangers volunteered to caravan Martin, from car to car, and after he arrived, Lien recalled this was the moment when she thought she and Becky should “go all in” on the idea of a sanctuary. Shortly after rescuing Martin, the couple rescued Pancake, whom Lien called “the starved goat.” Once incredibly malnourished, Pancake is now healthy and thriving, mischievous but well meaning. He is Martin’s buddy and seems to have the most energy of Little Acorn’s special needs goats. After Pancake came the sensitive goat, Sven. He struggles with mobility due to previously frostbitten legs and overgrown hooves. At Little Acorn, he has a specially-made cart to assist him with getting around, and a plethora of oversized stuffed animals for cuddling. Late in the fall, the Liens took in two Cornish Cross chickens, Hedwig and Snowcomb, and inside the house, the menagerie continues, with the family’s two dogs—the aged and stoic Rocco, and Piper, the highly excitable Pit Bull adopted from a St. Paul rescue. For the coming year, Lien said she’d like to see Little Acorn grow, but just a little bit. They are still able to take on a few smaller farm animals. For any non-profit, funding is always a concern. Little Acorn has a Patreon site, which, at the end of January, reached the milestone of having over 100 sponsors. “Patreon has been helpful because it allows people to give regularly,” Lien said, adding she had begun working with Eureka Compass—a vegan bodega in St. Paul. To get the word out about Little Acorn, both for fundraising and awareness, Lien primarily uses the sanctuary’s Facebook and Instagram accounts, regularly posting photos and videos of the animals. The organization’s website is a work in progress, though through it, you may order Little Acorn merchandise (hats, sweatshirts, t-shirts, et. al) which are produced locally and are housed in a makeshift gift shop in the front hall closet of the Lien home. Lien said soon there will be a page on the site for volunteers to sign up to assist on the sanctuary, as well as information on open house-style events where the public can come and meet the animals. Prior to my arrival at Little Acorn Sanctuary, I began following the organization’s social media pages. In going back through enough posts, I got the impression that the Lien family was not only rescuing farm animals, but that they were also vegans. It turns out I was right. The couple’s oldest daughter, 9 years old, is also vegan and has become an intense and vocal advocate for animal rights; their youngest daughter, 7, already a picky eater, is a vegetarian. Lien said she tries not to be too pushy with their vegan lifestyle when visitors come out to meet the animals at Little Acorn, adding in an ideal situation, anyone who walks through the door would walk out and no longer use animal products for anything. She added that, as a social worker, she strongly believes in “harm reduction” and encourages dialogue on what may be considered to be controversial topics. After meeting all the residents of Little Acorn, and before I depart, Lien and I chat about my own experiences as a vegan, as well as what it was like living with companion rabbits, and the work I do with the humane society in Northfield—my weekly attempts to socialize shy, scared or stressed out shelter cats. This entry was posted in Articles on March 20, 2019 by wpadmin.